With access to one of the country’s largest selections of quality LHD cars, we are able to offer some of the most attractive used left hand drive cars and some of the most competitive deals available. We regularly buy and sell left hand drive vehicles, with customers throughout the UK and mainland Europe.If you are looking to buy a left hand drive car before you move abroad, or simply to buy a higher spec LHD vehicle, give us a ring and we’ll see how we can help or advise you. We have particular expertise in exporting cars to and from Portugal, France and Spain, and can help you with all of the formalities. Located in comfortable showrooms near Heathrow Airport in West London (adjacent to the M25, M4 and M40, and just 20 minutes from the M1-J21), we offer all of the benefits of a long-established, family-run business – one which takes pride in offering the highest levels of customer service with every L.H.D car we sell. Alternatively send us an email and we can contact you with a list of LHD cars that meet your requirements. Can I just buy my LHD car from Europe? 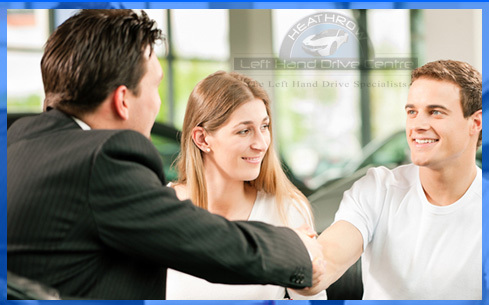 You will need to find a dealership and talk to them directly: you may not know if they’re a reputable company or speak your language properly. The language barrier can cause a lot of additional problems. It is not uncommon for people to end up paying more for your LHD car, as European dealers are more expensive than the UK! Having to deal with unfamiliar documentation often in a language your not familiar with. You’ll have to make your own transport arrangements. If something goes wrong, you’ll only be protected by the prevailing contract laws in whichever country the dealer is located, and often these can be unfamiliar. Remember, when you pay for your LHD car in your native currency, you will also save on exchange rates.